In the world of wedding planning, you'll find that you ask yourself a lot about tradition, and what is important to you. Especially on a day that is supposed to be the biggest day of my life, I keep coming up to things, and asking "Do I really want that? Does that really matter?" I'm finding that I am a good mix of traditional and non-traditional. 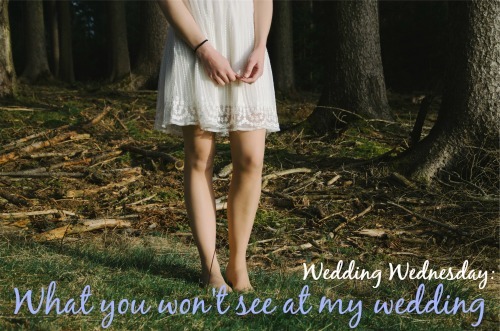 I don't want a weddingy feeling wedding. Dave and I probably won't see each other before the ceremony. A little bit tradition and a little bit not. 1. A cake. I just really don't like cake that much, and I don't want to spend a fortune on something that I don't like. I do like lots of other desserts, and I am all for that. I'm actually really looking forward to some ice cream options from the caterer! 2. A garter toss. I think this is a weird tradition and sort of icky. There's just no need, and time could better be spent dancing or eating. 3. A bouquet toss. I've been to a couple of weddings where the bouquet toss has gotten really out of hand. And that isn't classy, ladies. Also, with so many different lifestyles now, I think it is sort of outdated. I mean, Dave and I lived together for 2 years before we got engaged. It would have been weird of me to get up and join a bouquet toss, because I obviously already had a life partner. 4. A receiving line. I'm not sure if this is a tradition everywhere, but at most weddings where I'm from, the bride and groom, their parents and the bridal party receive the guests as they enter the reception. Again, I think that's really old fashioned. Dave and I are going to make sure to see each of our guests individually during dinner/dessert. 5. A religious ceremony. Neither Dave nor I are particularly religious, and we don't feel that our wedding needs to be that either. His uncle is going to be the one to marry us, and we are going to work with him to write the ceremony. We want the entire ceremony to feel personal and like it fits us. (Also, there will be NO reading of 1 Corinthians). 6. A first look. This is actually something that Dave brought up. He wants the first moment he sees me on that day to be when I walk down the aisle. I thought that was really sweet of him, so I concede. What about you? Was there anything that you didn't want at your wedding? I LOVE the way you think. Jason and I have lived together almost 4 years and when we get married, I think I'll leave out a lot of these things, too. Not everyone wants a traditional wedding and I 100% agree that many of these traditions are antiquated. We left everything above out of the wedding except #5 and even then, that was heavily altered. Instead of a bouquet toss, we did the anniversary dance and then I presented my flowers to the winning couple. It was a really great moment! We didn't do the garter or bouquet tosses, either--I just couldn't get my head wrapped around either of them. We didn't do a receiving line because I wanted a casual affair. We just went around and talked with people, and, since we only had about 80 people there, it made everything more informal! :) I also refused to say that I obeyed my husband during our vows, and our officiant happily changed it. It's YOUR day, so I'm glad you're making it your own! As a single lady I seriously hate the bouquet toss. All my married/taken friends always pushing me up there and most of the time there's not many singles there anyway so it's just awkward!! Ugh!! We didn't do a first look and I loved that we first saw each other when I was walking down the aisle. We also didn't do a garter toss - those images of husbands under their new wives' dresses, getting the garter was not something I wanted haha. Thanks for linking up with us this week! As a wedding planner, I despise the garter toss AND the bouquet fight, I mean, toss. I've seen women almost fight over that throw away bouquet as if it's a magical marriage wand. And it's embarrassing for the single ladies that don't want to participate and everyone is pushing them toward the spotlight. No to the receiving line, too. It's your wedding. Do what you want. We didn't have a garter toss or a bouquet toss and I am SO glad we didn't. We did have a cake, more or less to please my mom, and that was probably the most awkward experience of the night. Some people in my family started singing: "the bride cuts the cake, the bride cuts the cake" while I was cutting the cake and it was so so weird. I was mortified. We didn't do a receiving line either, we just made our way around the reception throughout the night to say hello to everyone. I'm glad we did it that way, too. All good things to skip out on! Great y'all are discussing what you both want! I love weddings! Right?! I just think it turns it into something that is so not classy. And a receiving line feels so impersonal. What kinds of things are you guys keeping and getting rid of? An anniversary dance would be cute!! I agree. A religious ceremony is definitely something that is just a personal preference. That's just not us. But I can totally agree with other couples having whatever religious ceremony fits them. There were a lot of wedding rules that my husband and I broke..some of them not even on purpose. lol! I was just so totally clueless about weddings and spent most of my life thinking I never wanted to get married...and then I met my now husband and that changed. We didn't do a receiving line but we made sure to visit every table and talk to everyone that came. I am not a huge fan of the whole removing the garter thing...it's a little awkward to have my husband put his hand up my dress in front of all of our family. And we did not get married in a church...we got married on the beach. I was on the fence about the garter toss, especially after reading up on the history of it. Ew. I was very clear that there would be no raunchy songs playing during the garter toss, and Tim was not allowed to stick his head under my dress or use teeth or anything... Ew. Its your wedding make it your own. The neat thing about the various weddings I have been too, none of them are the same, each reflect the couple getting married and has unique things about it. Wedding planning can be stressful, make the day your own, it makes it all the more memorable. Yeah... I'm on the fence about wearing one, because it's a nice keepsake. But I don't want to do the whole thing. Just weird. I love beach weddings!! I think visiting every table is so much more personal. Right! Seriously who wants to go to a wedding and feel awkward. It should be fun. No awkwardness at this wedding. Good to know! I am planning to take his name, but I do like "the newly married couple" or "the newlyweds" or something like that. That puts you more on equal ground. Love it! I've heard of anniversary dances. Now I'm thinking of something like that instead of a bouquet toss. That is my mission, is to make it reflect us as much as possible. I have been to many weddings where it feels so cookie cutter. I don't want that at all. Yes. Most of these things are pretty trivial. I mean, who is going to miss a bouquet toss. Also, I agree with you that it's way more meaningful to go around and thank your guests personally and connect with each one of them. :) That's what I've been hearing from most people! Garter/bouquet toss is going to be a no go. I can't wait for that moment walking down the aisle! And the photos from it! But the ones from the bouquet and garter---ugh! You are right. Those are not something I want either. Yes. I want this to be fun, relaxed and full of love. Nothing awkward or stuffy. It's in a barn for goodness sakes. I just have this (nightmare) image of weddings in old fashioned stuffy banquet halls where everything is old and the food is bad and salty. I'm such a brat. Yay! I can't wait to have you stand up there with us!! Uncle Jim is going to marry us. Uncle Jim C. And that is cute! Right. No awkwardness allowed at something that is supposed to be so fun! I can't wait to see how your wedding comes together! Actually after our initial talks with the caterer, it is going to be more of a dessert bar, with sundae station, chocolate covered strawberries and maybe some cookies. I agree with you on the first look part (especially the nerves! ), but this is one thing that Dave is really adamant about. I'm excited to see yours as well!! I LOVE the idea of a dessert bar..so modern and gives everyone a chance to find something they may like. We didn't do a bouquet or a garter toss. I just think they are silly traditions and we didn't want a part of that. We also had a very non-traditional ceremony. If you want to read our ceremony, including everything from vows to a funny story, let me know. I will give you the link. It's so fun to reread our ceremony whenever I want to. We did a first look, and it was the best thing we did. But I do understand that if the groom has an opinion, you need to follow it. It just made sense for us with the timing of everything, and our first look pictures are my favorites. Our photographer is really suggesting a first look, but like you said, this is one of the only things my fiance has a strong opinion about. I'd love to read your ceremony! Dave's uncle is going to be officiating, so we have a lot of freedom to make our ceremony into what we want. Here is our ceremony. Enjoy it!